The swimsuit previously had “flappy” shoulder straps. THE latest hack sending Kmart fans into a frenzy costs just $12 - and all you need is a needle and thread. The discount department store has developed a legion of fans who pride themselves on re-imagining items such as cubby houses and homewares. This time, the product getting a makeover is a humble $12 swimsuit. 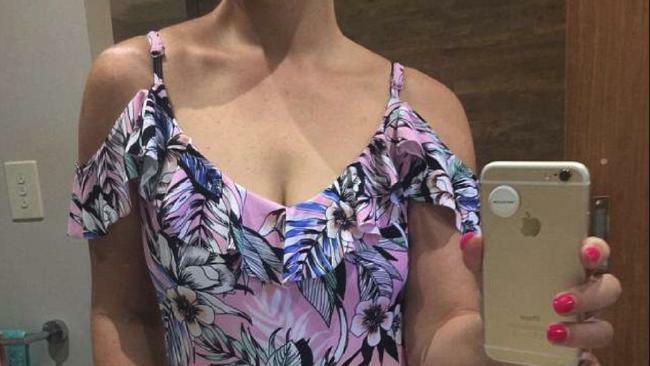 An Aussie woman bought the $12 swimsuit from her local store, but took issue with the "flappy shoulder frills". "Purchase [sic] these tops at my local for just $12," she wrote on Facebook. "Didn't try on prior to purchasing and wasn't to [sic] keen on the flappy shoulder frills,' she said. The imaginative customer took matters into her own hand and grabbed a needle and thread. "A needle and thread and 10 mins later - frills are up. Lived in these all weekend and got loads of nice comments and couldn't believe they were only $12,' the woman continued. The customer grabbed a needle and thread, pinning the shoulder straps up. "Note if you are going to take the frills up make sure the strapes [sic] are at the right length as you can't readjust once sewed." The simple trick will no doubt inspire other Kmart fans to get creative.